I went into my first experience at Dreamforce bright eyed and bushy-tailed. 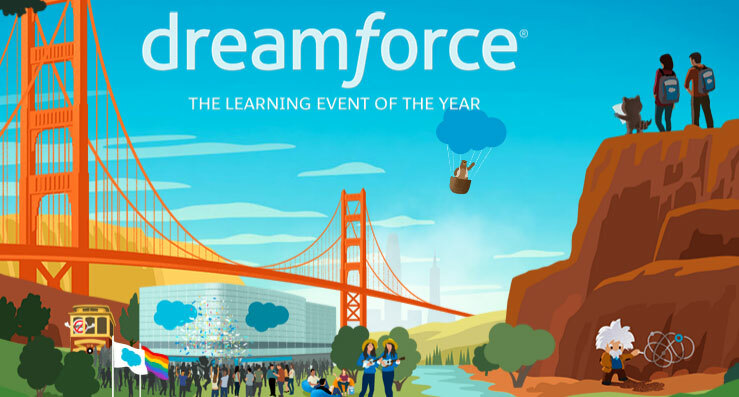 I prepared (so I thought) by adding anything and everything to my agenda for the entire four days, prepared by running through the Dreamforce badges in Trailhead and read up on third-party blogs about what to wear and what to do. But deep down, no matter how much I had prepared, I had this looming feeling that once I arrived, my agenda would be blown to bits. Low and behold, that is exactly what happened on day one. Here’s a skim through of my first day and my very first experience conquering the beast. Data is key to building and defining KPIs during a customer journey, no matter if it’s being executed within a Salesforce product or any other marketing technology. By now, I had lost hope for the rest of the day in the Marketing, Commerce, and Retail Lodge. The agenda I once had was a bust, the sessions I wanted to get into were jammed to the point that people were being turned away and I felt a bit hopeless. But, instead of letting the chaos of Dreamforce take me down, I took a deep breath, tightened my backpack straps and got to steppin’. Shortly after, I was able to sit in on a small breakout session about the importance of mobile ecommerce shopping experiences, which was a good nod to the best practices SS Digital Media executes in our mobile web strategies. Take a peek at the image below for some of the tidbits I learned during that brief session. Don’t let the time alter your reality of the number of breakout sessions held at any given moment. By noon on my first day at Dreamforce, I had already been to five different sessions, as I went toe to toe with the hundreds of other attendees between the marketing floor and Customer Success Expo (I’ll get to that in the next paragraph). Unfortunately, the sheer breadth of people in attendance made it difficult to attend sessions if scheduled back to back. There were a few times I had to leave a session early to get in line for another session, in hopes I would make it in time or even at all. The Customer Success Expo in the Moscone Center South was just one of the many hearts of Dreamforce and home to a few sessions on my scheduled agenda. Although brief, these sessions really shed light on the strategies we currently execute on behalf of our Partner Clients in Pardot and helped me to determine that we are on the right path. The theme of Dreamforce this year is strong and evident around every corner, every piece of swag and especially throughout the opening keynote, We Are All Trailblazers: Customer Success in the 4th Industrial Revolution. Salesforce founder and CEO, Marc Benioff opened the keynote with deep insight into how we are in the midst of the fourth industrial revolution and how connected technology is ever changing, bringing the world closer together. Salesforce is at the cusp of innovation with their various cloud technologies and this keynote painted the picture that this industry is only gaining speed. Below is a great visualization of the technological revolution at hand, provided by Salesforce. Throughout the keynote, industry leaders from adidas, 21st Century Fox and T-Mobile provided their own vantage points of how Salesforce’s cloud technologies have brought their organizations to the top of the market and continue to help them achieve unprecedented growth. The opening, two-hour keynote reset my brain from this day’s madness and opened my eyes to the amount of data and technology being developed and mastered by Salesforce day after day. This realization put my first day at Dreamforce into perspective. It made me realize that this conference isn’t just about what is happening in the industry right now but what is coming down the pipeline and trust me, it’s HUGE. Monday forced me to rethink not just how I entered day two but completely re-think my session strategy, what I attempt to attend, that I wasn’t going to get into everything and that was okay.